Boasting premium features and connectivity, the Pro EX9220 wireless portable projector allows you to present with confidence. Delivering 3,600 lumens of color/white brightness (1), it projects bold, colorful images, even in well-lit spaces. Featuring 1080p+ WUXGA resolution (1920 x 1200) — 4.5x more than SVGA — the Pro EX9220 achieves outstanding image quality. And, it offers robust wireless connectivity — including screen mirroring with Miracast — as well as HDMI and MHL (2). Plus, Epson 3LCD projectors deliver remarkable color accuracy, with up to 3x Higher Color Brightness (3) and up to 3x Wider Color Gamut (4) over competitive DLP projectors. 3. Color brightness (color light output) in brightest mode, measured by a third-party lab in accordance with IDMS 15.4. Color brightness will vary depending on usage conditions. Top-selling Epson 3LCD projectors versus top-selling 1-chip DLP projectors based on PMA Research sales data for Dec. 2015 through Nov. 2016. 4. Gamut volume in brightest mode, measured by a third-party lab in 3D in the CIE L*a*b* coordinate space. Top-selling Epson 3LCD projectors versus top-selling 1-chip DLP projectors based on PMA Research sales data for Dec. 2015 through Nov. 2016. 5. 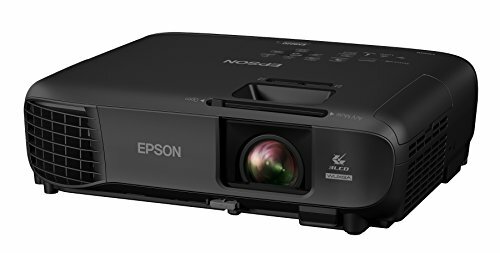 For wireless functionality, including via the Epson iProjection App, the projector must be configured on a network, either through the Ethernet port on the projector (check model specifications for availability) or via a wireless connection. Check your owner’s manual to determine if a wireless LAN module must be purchased separately to enable a wireless connection. Not all Epson projectors are able to be networked. The Epson iProjection App does not support all files and formats. See our official site for details. 6. Depending on your MHL device, charging may not be supported. 7. Based on TFCinfo: U.S. Projector Brand Customer Perception and Preference Study, Multimedia Projectors 2017. More accurate, vivid color, even in well-lit rooms - 3, 600 lumens of equal color and white brightness (1). Pro-quality projector - 1080p+/WUXGA resolution (1920 x 1200) offers 4.5x more resolution than SVGA for full HD 1080p content. Remarkable color accuracy - up to 3x higher color brightness (3) and up to 3x wider color gamut (4) with Epson over DLP projectors. Wireless - project from your laptop, tablet, or smartphone (5) without plugging into the projector, so you can move freely about the room.